A recent renovation of our Clubhouse is now complete. 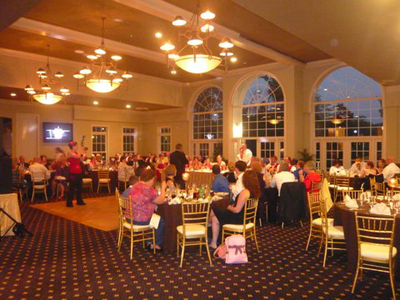 The renovation has increased our Banquet Room occupancy to 200 people and has added an additional 1,000 square foot deck to compliment our new Banquet space. The renovation also included upgrades to our existing interiors. Muliigans, our Indoor/Outdoor dining area is open now as well. 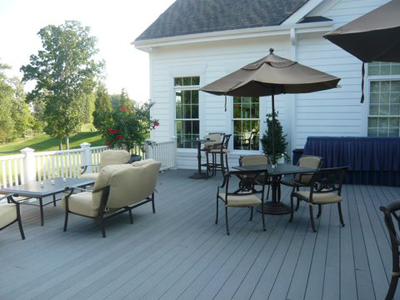 Sit in the shade while watching the latest sporting event on our outdoor flat screen TV. 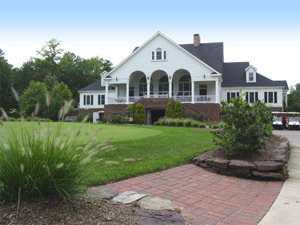 For more information about Westfields Golf Club Banquet Services, please contact our Events Manager at 703.631.9370 Ext. 16. A recent renovation of our Clubhouse is now complete. This renovation has increased our Banquet Room occupancy to 200 people and has added an additional 1,000 square foot deck to compliment our new Banquet space.